How would you describe snack time at your house? Boring? Chaotic? Unhealthy? Yikes! It’s time to change how you think about snack time. Instead of it being an inconvenience or an afterthought, think of snack time as an opportunity to encourage your little ones to make nutritious choices and to spend some quality time together. No, I’m serious. Need a little inspiration? 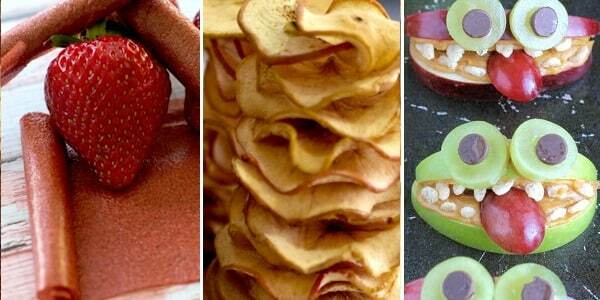 Check out these 38 healthy fun snacks for kids. 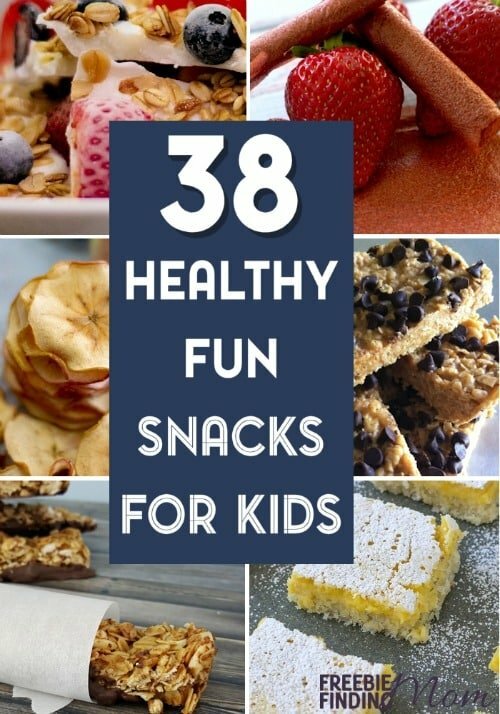 Trust me, if you start whipping up these 38 healthy fun snacks for kids (or these 25 healthy homemade snacks) all those around you will be green with snack-envy! Tip: While most of these healthy fun snacks for kids are super quick and easy, I know that there are some horrible days where you simply can’t even think about cooking. For those too-busy days, there are some healthy store-bought options you can turn to. Check out these quick healthy snack options for kids. 1. Pan Fried Cinnamon Bananas (Freebie Finding Mom) – On top of being a healthy fun snack for kids, this dish would be a great addition to any breakfast. It’s a tasty way to get your little one to eat bananas which are rich in fiber, potassium, vitamin B6, and many more essential nutrients. 2. Homemade “Go-Gurt” With Hidden Veggies (Freebie Finding Mom) – Need a grab-and-go snack? This healthy fun snack for kids is perfect for a busy family on the go. Plus, in addition to the super nutritious Greek yogurt, this recipe allows you to sneak some important veggies into your kid’s diet. Psst! Looking for more yogurt recipes? Here are 30 healthy yogurt recipes you won’t want to overlook. 3. Healthy Frozen Yogurt Bark (Freebie Finding Mom) – Speaking of yogurt, you won’t want to miss out on this frozen treat. This healthy fun snack for kids is a great way to beat the heat this summer. Tip: It isn’t just kids that’ll love this yogurt bark so be sure to make enough for the whole family! 4. Healthy Baked Broccoli Bites Recipe (Freebie Finding Mom) – This healthy fun snack for kids isn’t just for snack time. Serve this up as a side dish for dinner and watch as a miracle happens. Yep, your little one will willing eat a vegetable right before your eyes. 5. Zucchini-Oat Chocolate Chip Cookies (Freebie Finding Mom) – Just because we’re trying to make snack time a little healthier doesn’t mean you have to swear off cookies. This healthy fun snack for kids allows you to still indulge in a snack time classic, cookies and milk, without the guilt of totally empty calories. 6. Fruit and Chocolate Ladybugs (Freebie Finding Mom) – Want a snack that is sure to impress? This is it! Oh, and between you and me, this healthy fun snack for kids is not nearly as hard to make as it looks. 7. Coconut Oil Popcorn (Freebie Finding Mom) – With just 3 ingredients healthy fun snacks for kids don’t get much easier than this. This is also the perfect option for a home movie night. 8. Microwave Cinnamon Apples (Life with Captain Fussybuckets) – Dressing up fruit (like with cinnamon and honey) is a great way to convince your kids to eat it. This healthy fun snack for kids is ideal when their sweet tooth is acting up. 9. Homemade Strawberry Fruit Roll Ups (Living Sweet Moments) – Do your kids love fruit snacks like fruit roll ups? Instead of blowing your budget on name brand not very nutritious options at the store, consider making your own with the help of this healthy fun snack for kids recipe. 10. Homemade Crunchy Apple Chips (Living Sweet Moments) – Instead of greasy potato chips, serve up this healthy fun snack for kids. With roughly 4 grams of fiber per apple (medium sized) and 14% of your daily recommended vitamin C, it’s no wonder an apple a day keeps the doctor away! 11. Apple Monsters (Two Healthy Kitchens) – Looking for a healthy fun snack for kids that is sure to put a smile on your little one’s face? Look no further! While the chef intended these to be a special Halloween treat, I guarantee they’ll please year round. Bonus: Here are some more Halloween inspired snacks. 13. Rainbow Veggie Kabobs (Two Healthy Kitchens) – Brighten up the day with this colorful healthy fun snack for kids. Tip: As long as you can trust your little one with a pointy stick he or she can help out with this super simple recipe. Note: Having a rainbow themed party? This healthy fun snack for kids (and adults) would make a great addition. 14. “Veggie Faces” No-Bake Vegetable Pizzas and Wraps (Two Healthy Kitchens) – Looking for a healthy fun snack for kids that the kiddos can help out with? Look no further. This hands on snack is a great way for them to get creative and use their imaginations. 15. 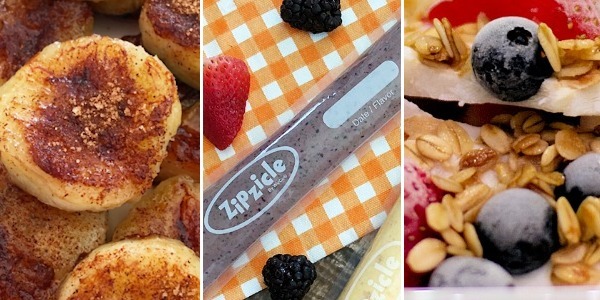 Fruit and Cheese Kabobs (All She Cooks) – This customizable healthy fun snack for kids is a great way to use up whatever healthy ingredients are languishing in your fridge. Don’t be afraid to try unusual flavor combinations. 16. Cheerios Snack Crunch (All She Cooks) – While the chef behind this healthy fun snack for kids provides a delicious recipe for you to follow, you can easily switch ingredients out based on what you have on hand. This is the prefect recipe to use up whatever leftovers are lurking in the back of your pantry.